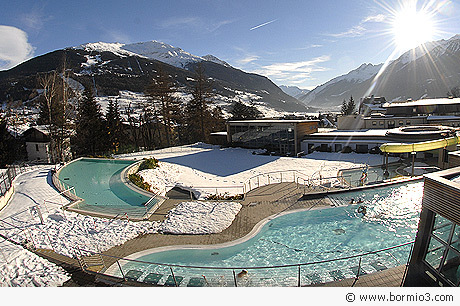 Bormio in Italy boasts three thermal centres: Bormio Terme, Bagni Vecchi and Bagni Nuovi. Together, they offer more than fifty different beauty, wellness and health treatments and therefore tailored to everybody’s needs. Here you can take care of your health, have fun or simply relax. The waters of Bormio - classified as sulfurous , alkaline, muddy, mineral and radioactive - flow at a temperature of about 41° C from nine different springs located at the foot of Mount Reit, close to the Zebrù chasm - an important tectonic area. Geologists claim that these waters are "vadose" as they sink to a depth of about a thousand metres below the earth's surface where they are heated by the high temperature of the rocks before rising back up. The hot waters of Bormio have been use since ancient times. Indeed, the name of the village is either related to the German word “Warm” (warm) or referencing the two Gallic gods Borvo or Bormo to which many other thermal resorts of the time were dedicated. The beneficial waters of Bormio were already appreciated and used by the time of the Romans. In the 1 century AD, Pliny the Elder mentioned Bormio in its Naturalis Historia as did Cassiodorus, who wrote about the "acquae burmiae" in a letter to the Ostrogot King Teodatus. Additional evidence of the Roman presence in Bormio is seen in the ancient ruins which adorn the Bagni Vecchi area. "In cima alla Valtellina c’è Burmi. A Burmi sono i bagni." (At the top end of Valtellina there is Burmi. In Burmi are the baths”).